DOWNLOAD Over 485 RnB Drum Loops & R&B Drum Beats! This modern construction-style r&b drum loop library provides 20 multi-track R&B club drum themes at 2 popular r&b dance tempos (111BPM & 116BPM). Each multi-track drum theme delivers layered performances of R&B dance drums, percussion, and percussive sound effects where each layer is separated into its own individual loop file. All loops are modeled in the style of platinum R&B music producers such as Stargate, Timbaland, Bloodshy and Avant, Red Zone, Darkchild, Scott Storch, Dr. Dre, and the Neptunes! 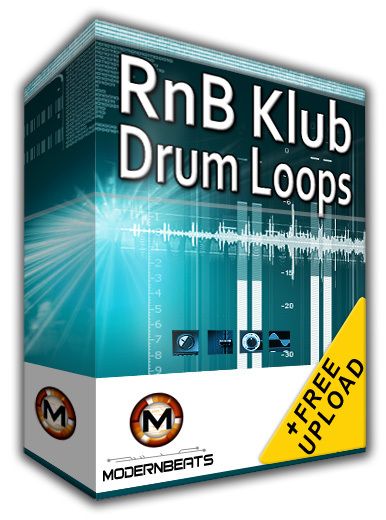 RnB Klub Drum Loops Collection - Download the complete collection (Volumes 1 & 2) to get over 975+ r&b loops (2,410+ files) in 4 tempos (111BPM, 116BPM, 121BPM, 127BPM) provided in 3 formats (WAV/AIFF/REX2). Packed with a hugh variety of quality hit RnB club drum productions, the whole "RnB Klub Drum Loops" series is a must have for the serious modern music producer! All drum loops mix-match seamlessly together, allowing users to combine and create thousands of original multi-track drum compositions with ease! Modern Analog Kicks, Booms, Snares, Claps, Percussion, FX! Modern Sample Kicks, Booms, Snares, Claps, Percussion, FX! Multi-track World Ethnic Percussion & Cymbal Programming! Multi-track Conventional Percussion & Cymbal Programming! Bonus Sound FX Layers, Atmospheres, & Noise Accent Loops! Both Live & Programmed Multi-Track Drum Beat Production! Vintage Dynamics Processing for Added Warmth & Punch! Many Drums Recorded via World-Class SSL4000G+ Console! Construction-Style Format for 1,000's of Beat Combinations!